[AUTO](VC/RC):Success 20000 [AUTO](VC)[1/Turn]:When this unit is placed on (VC), or when your G unit Stride, choose up to one card from your hand, call it to (RC), and it gets [Power]+4000 until end of turn. If you called a card, at the end of that turn, draw a card, and retire that rear-guard. [AUTO](VC/RC)[1/Turn] Generation Break 1:[Counter Blast (1)] At the end of the battle that this unit attacked, if this unit is successful, you may pay the cost. If you do, choose one of your other rear-guards, [Stand] it, and it gets [Power]+4000 until end of turn. An argument could be made for either version of Darkface, but this new Bigbelly is undoubtedly the new main ride for Bigbelly decks. Not only does the Stride skill carry the Altmile clause, so you don’t need to have a perfect field before Stiding, which addresses the Bigbelly deck’s main problem, it also carries a way to keep the attacks coming on RG circle as well. His main drawback is that he cannot power up existing units, but today’s meta’s control heavy so it shouldn’t matter that much. For any other matchup one of the other 2 Bigbellys is an option to fall back on as long as you run 4 of his Stride fodder. Main ride for the meta of today. Just don’t go too mad with him. What’s up, Rogue Squad?! For today’s card, it’s from a clan which I have extremely mixed feelings with. Don’t get me wrong; Great Nature is a very fun clan and is often overlooked compared to others, and the same is said with this new pack, where Gredora and Ahsha take the center stage, and Bigbelly here is put to the side. 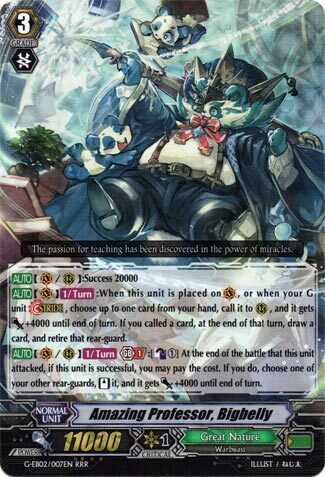 With that said, personally, whenever I pilot the deck, I have the WORST luck with them (like post mulligan all Grade 0’s & 3’s, failing the G Assist and proceed to Damage Check all Grade 1’s until the turn I die), but enough about my frustrations with furries; let’s look at the principal of pandas. This new Bigbelly is, by far, the best version of the obese panda that we’ve seen as it’s not as field reliant (which is great considering the Meta right now is very destruction/distrupive nowadays), so calling a unit with a free +4K and a draw-tire skill (draw & retire to those that don’t understand my lingo). Combining this skill with the likes of Crayon Tiger and even this Bigbelly’s on-attack skill can really make sure your power gets to the according Success levels.